During the year 2015-16, under Budget Estimates, Rs.600 crore have been allocated to the States/UTs under Swadesh Darshan Scheme. The North East States have received the major part of the funds. Government of India sanctioned Rs 169.87 crore for States of Manipur & Sikkim in 2015-16. The Ministry has launched the Swadesh Darshan scheme with a vision to develop theme based tourist circuits on the principles of high tourist value, competitiveness and sustainability in an integrated manner by synergizing efforts to focus on needs and concerns of all stakeholders to enrich tourist experience and enhance employment opportunities. 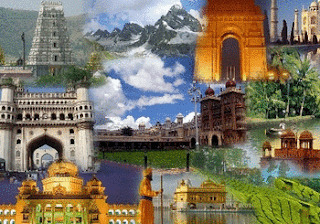 Under the scheme twelve themes have been identified for development initially, namely: North-East India Circuit, Buddhist Circuit, Himalayan Circuit, Coastal Circuit, Krishna Circuit, Desert Circuit, Tribal Circuit, Eco Circuit, Wildlife Circuit, Rural Circuit, Spiritual Circuit and Ramayana Circuit. Archaeological Survey of India (ASI) has carried out excavation in 2007 at Dwaraka in collaboration with Indian Navy and documented the submerged structural remains in the Arabian Sea. In the forecourt of Dwarakadheesh temple, excavation was carried out over the natural bedrock which revealed-coins of copper, animal figurines of terracotta, sculptural and architectural fragments, bangles of shell, bone and glass, beads of stones and terracotta, rings, stones and variety of plain and decorated potsherds which seem to be of historical period. Excavation was also conducted near-shore region southwest of Samudra Narayan temple and found wooden block from a submerged circular structure. During the last five years, Archaeological Survey of India (ASI) has not conducted any exploration/excavation work in ocean. The funds for oceanic excavation are provided from general funds allocated for excavation and exploration to the Archaeological Survey of India. (ii)“7.88 per cent Government Stock 2030” for a notified amount of Rs. 6,000 crore (nominal) through price based auction, (iii) “7.95 per cent Government Stock 2032” for a notified amount of Rs. 3,000 crore (nominal) through price based auction, and (iv) “8.17 per cent Government Stock 2044” for a notified amount of Rs. 3,000 crore (nominal) through price based auction. The auctions will be conducted using multiple price method. The auctions will be conducted by the Reserve Bank of India (RBI), Mumbai Office, Fort, Mumbai on August 07, 2015 (Friday). Both competitive and non-competitive bids for the auction should be submitted in electronic format on the Reserve Bank of India Core Banking Solution (E-Kuber) system on August 07, 2015. The non-competitive bids should be submitted between 10.30 a.m. and 11.30 a.m. and the competitive bids should be submitted between 10.30 a.m. and 12.00 noon. The result of the auctions will be announced on August 07, 2015 and payment by successful bidders will be on August 10, 2015 (Monday). E-Auction of the First Batch of Private FM Radio Phase III Channels re-commenced today on 03rd August 2015 at 09.30 A.M. and during the day, four rounds of bidding took place. Till now, 24 rounds of bidding are over. At the close of the sixth day of bidding, 82 channels in 56 cities became provisionally winning channels with cumulative provisional winning price of around Rs 779 Crore against their aggregate reserve price of about Rs 395 Crore. Thus the summation of provisional winning prices exceeded the total reserve price of the first batch by about Rs 228.68 Crore or 41.56 %. Rs 550.18 Crore is the total reserve price of the first batch. The Auction for the first batch comprising 135 FM Channels in 69 existing cities of Phase II began on 27th July 2015. The Auction Activity Requirement of 80% set at the beginning of the auction continued to remain the same on the sixth day. Daily auction report for day 6 has been put on MIB website, www.mib.nic.in. Bidding will re-commence on 4th August, 2015 at 09.30 AM. of employed persons including part time and full time was estimated at 47.4 crore. Apart from survey on employment and unemployment conducted by NSSO, employment exchange statistics regarding jobseekers are also complied based on information received from States. There are presently 978 employment exchanges in the country leading to approximately one exchange per 12.4 lakh population. Entrepreneurship for making broad policies for all other Ministries/Departments with regard to market requirements and skill development and co-ordination with all concerned for evolving an appropriate skill development framework, removal of disconnect between the demand for and supply of skilled man power through vocational and technical training, skill up-gradation & building of new skills. Government of India has set target of skilling 5 crore persons in the 12th Plan. Government is imparting vocational training under Craftsmen Training Scheme (CTS), Apprenticeship Training Scheme (ATS) and skill development through modular courses under Skill Development Initiative Schemes. The Government runs various public employment generation schemes like Mahatma Gandhi National Rural Employment Guarantee Act (MGNREGA), Swarna Jayanti Shahri Rozgar Yojana (SJSRY) restructured into National Urban Livelihoods Mission (NULM) since September, 2013, Deen Dayal Upadhyaya Grameen Kaushalya Yojana (DDU-GKY), and Prime Minister's Employment Generation Programme (PMEGP). In addition, the government is promoting labour-intensive manufacturing and increasing employment opportunities by promoting tourism and agro-based industries. As per information received from the States, State-wise details of placement effected through employment exchanges in the country during the last five years are at Annex-II. Total number of educated job seekers on the live register of employment exchanges in the country as on 31st December 2012 was about 3.75 crore of which about 45 percent was 10th pass, 31 per cent 10+2 pass and 24 per cent graduates and post graduates. There is no specific scheme to provide employment to the computer educated youth. However, to make youth including computer educated youths employable, several schemes are being implemented by various Ministries of the Government of India for their skill development which include training courses of duration ranging from few days to more than a year. A new Ministry of Skill Development and Entrepreneurship has also been established to coordinate the skill activities across Ministries. Moreover, to improve the employability of youth including computer educated youth, around 20 Ministries run skill development schemes across 70 sectors. According to the data compiled by National Skill Development Agency (NSDA), about 51.50 lakh persons were given skill development training in the year 2014-15 under these schemes. National Skill Development Authority (NSDA) has informed that State/UT-wise detail is not maintained by them. Under the National Policy on Skill Development, a target of skilling 5 crore people has been set during the 12th Five Year Plan. Vocational training is imparted through network of more than 12106 ITIs and the present seating capacity in these ITIs is about 17.11 lakh. This Information was given by the Minister of State(IC) Labour and Employment, Sh. Bandaru Dattatraya in Lok Sabha today.